Like we have published HERE, recently Nakivo has announced that they will now support QNAP NAS with their QNAP appliance. So this means that now we can install the Nakivo Backup tool directly inside of a QNAP NAS and no need for a Backup Server to backup our environment. 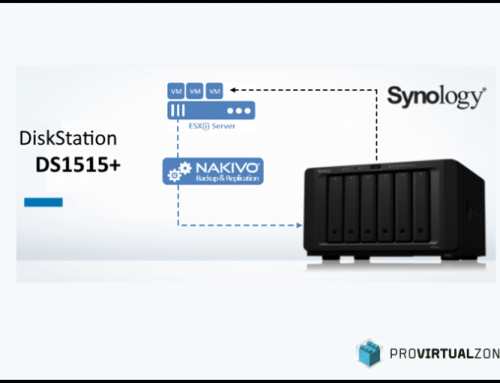 More information about this Nakivo Backup Appliance HERE. 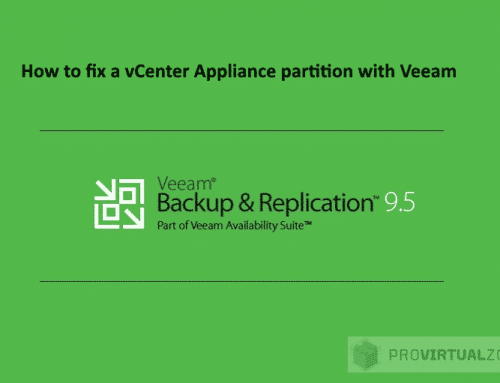 For this article, I have made some tests with this new Appliance and check the resources that are used inside the QNAP, and for comparative I have done the same Backups with a Windows Nakivo server, connecting to the same vCenter and backup the same VMs. Let us install Nakivo BR appliance inside the QNAP. Install Nakivo QNAP Appliance from QNAP Store Apps (QNAP need to have access to the internet to use this option). 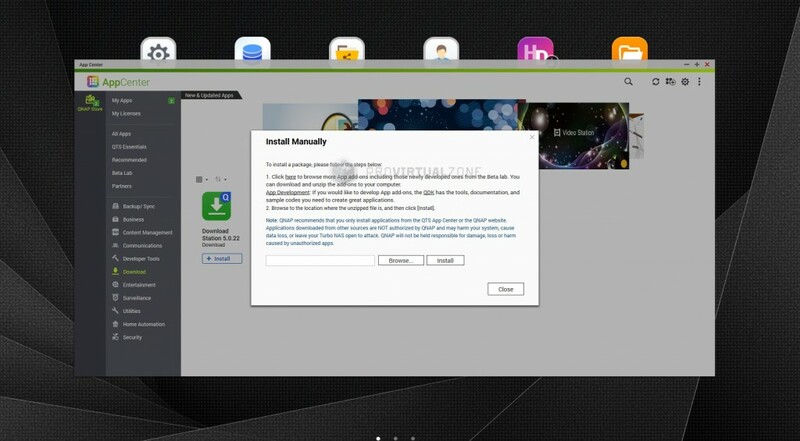 The first option is to install Nakivo with QNAP Store Apps. 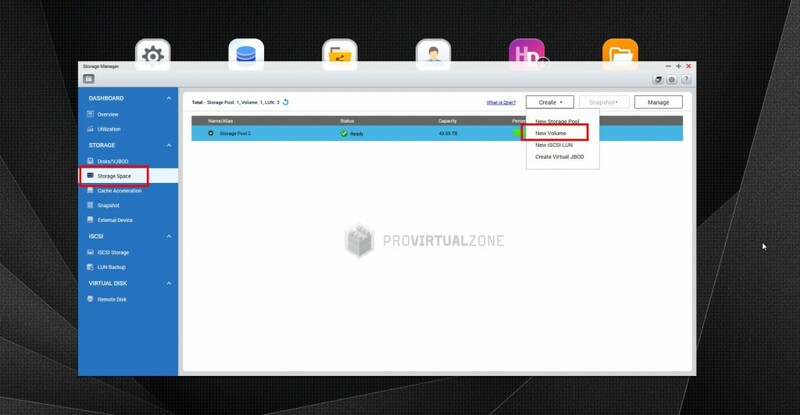 Connect to your QNAP and log in and in your App Center click All Apps. Next the search field type “Nakivo”. This will find Nakivo Appliance quickly. Next click install in the App. 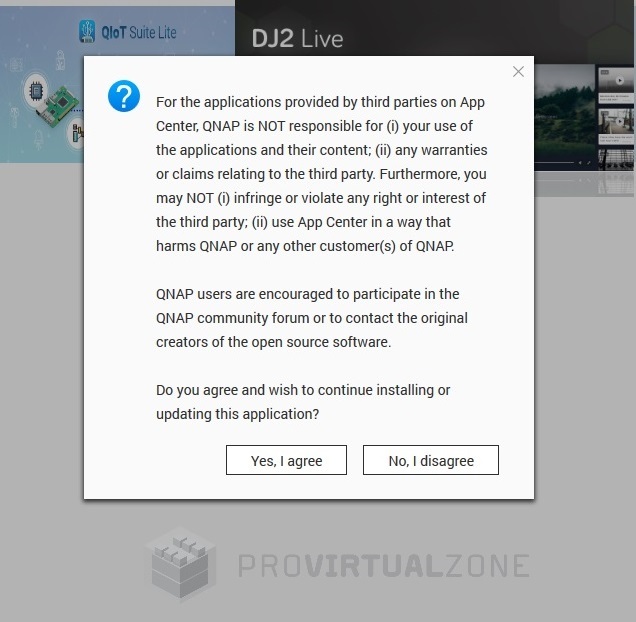 After you agree and install Nakivo appliance should install in your QNAP. But in my case, I had an error. After troubleshooting this issue, it seems is because I don’t have any Volumes, or the default Shared Folders (public and web) in my QNAP. As you can see in the next image, there is no Public Shared Folders. Since this QNAP is used specifically only for iSCSI, there was no need to install NFS or Shared Folders, and if you want to install an App in your QNAP, you need at least one Default Volume. Note: If you have already a Volume, but deleted the Public Shared Folder you can try to recover without the need to create a new Volume. Open your Panel Control / Privilege / Shared Folders. If you have a Volume, Public folders can be restored, and you can now return to Step 1and in your Nakivo icon click install again. If you don’t have a Volume, then you get the same type of error and need to follow the rest of the procedure to create a new Volume and Public Shared Folders. Install the QNAP Volume and create/enable Shared Folders. Go to your QNAP Storage Manager and Storage Space option and create a New Volume. Then if you go back to Shared Folders options ( Panel Control / Privilege / Shared Folders ), you now see the Public Folders created (Public and Web). Now that we have our new Volume and Shared Folders, we can restart our install again. 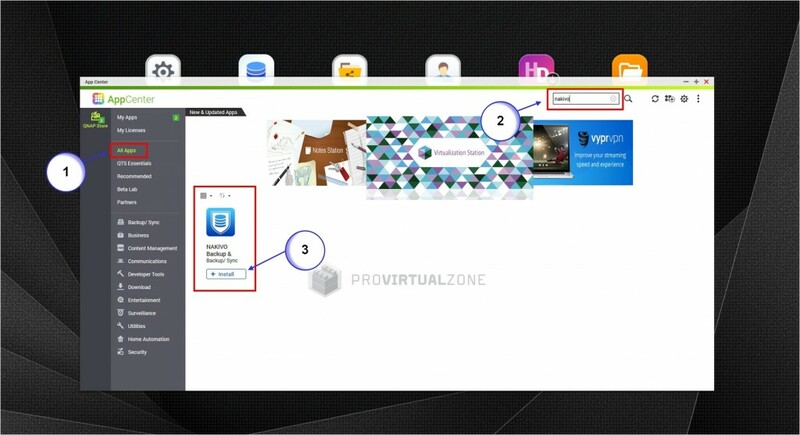 Search again for Nakivo App (Step 1, first image), Click in Install and your Nakivo QNAP Appliance installation started. Then click Yes, and your Nakivo QNAP Appliance opens a Browser tab with https://NQAP-IP:4443 (Nakivo QNAP Appliance uses Port 4443). However, if your QNAP doesn’t have internet, then you need to install the Nakivo QNAP Appliance manually. Install Nakivo QNAP Appliance manually. First, we need to download the file from Nakivo website. You can download from HERE. Then in App Center click right upper corner in the option, install Manually. Just browse to file location and install. Now we have installed our Nakivo QNAP Appliance; we need to configure. 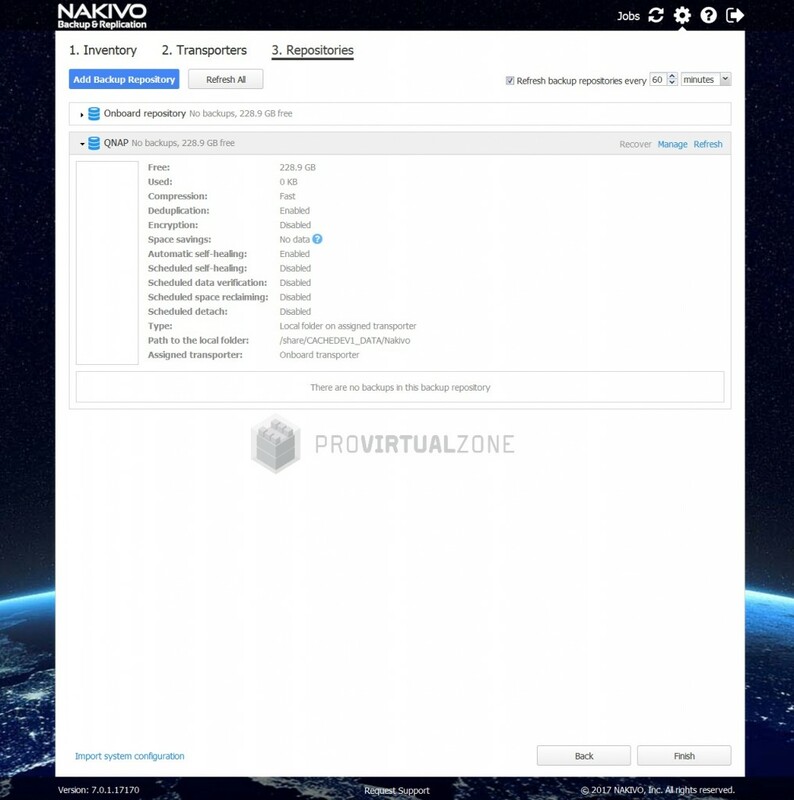 The configuration of this Nakivo Appliance is no different from what we have already show HERE in a previous article (Install Nakivo in Windows Servers). The one difference here that I like to point is that the default repository uses the free space for the new Volume (and Public Shared Folder) we have created to create our Shared Folders. 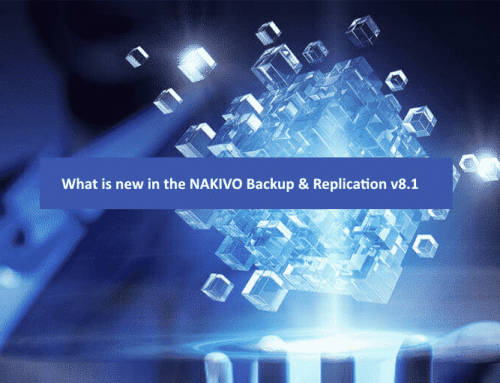 Since I do not want to allocate Backups VMs in the same Share Folder that we have Nakivo Appliance, I created a new Share Folder just for backups and add as new Nakivo Backup Repository. Note: This is a test environment, in a production environment we should create a new Volume in a different Storage Pool for this repository. 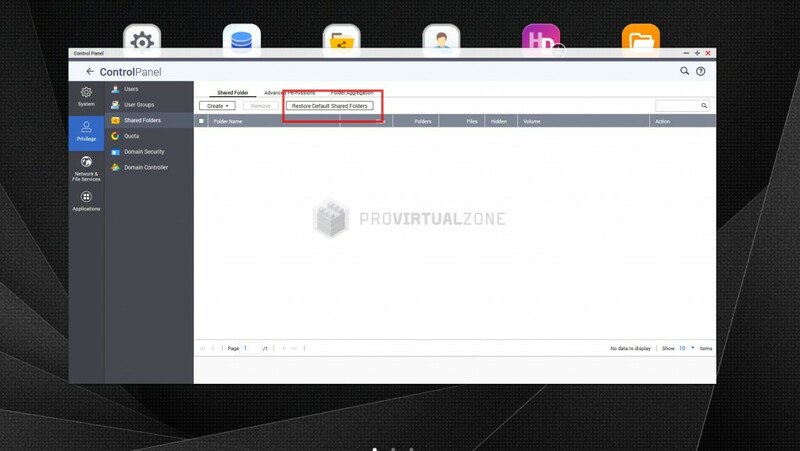 Log in into your QNAP NAS and go again to Panel Control / Privilege / Shared Folders and then select Create Shared Folder. Select the Disk Volume that you want to use for this New Shared Folder and give it a name (I used Nakivo). Just click Create and finish. 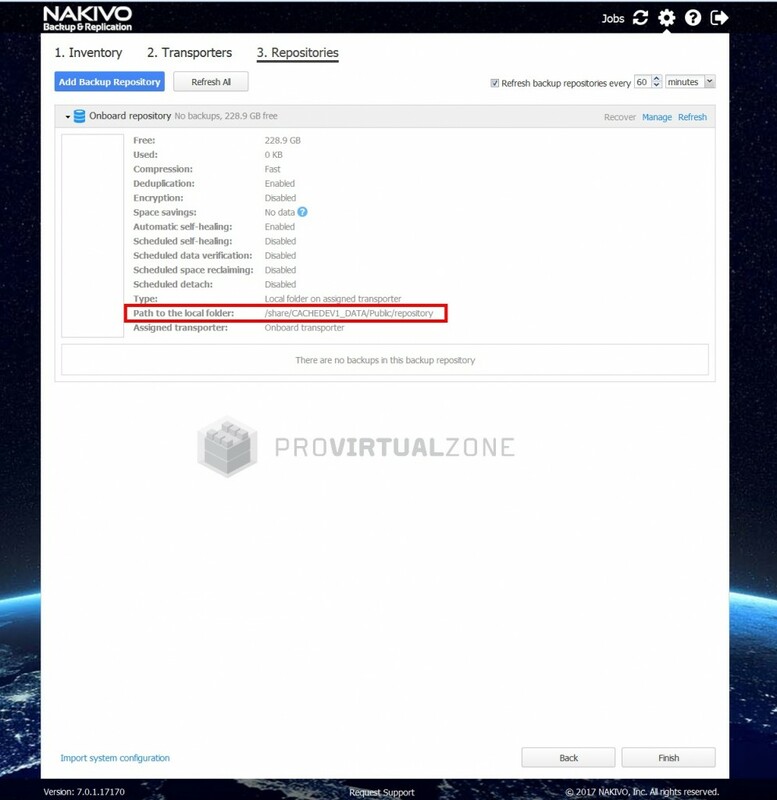 Now we the new Shared Folder we create a new Nakivo Repository using “Local Folder on the assigned transporter”. 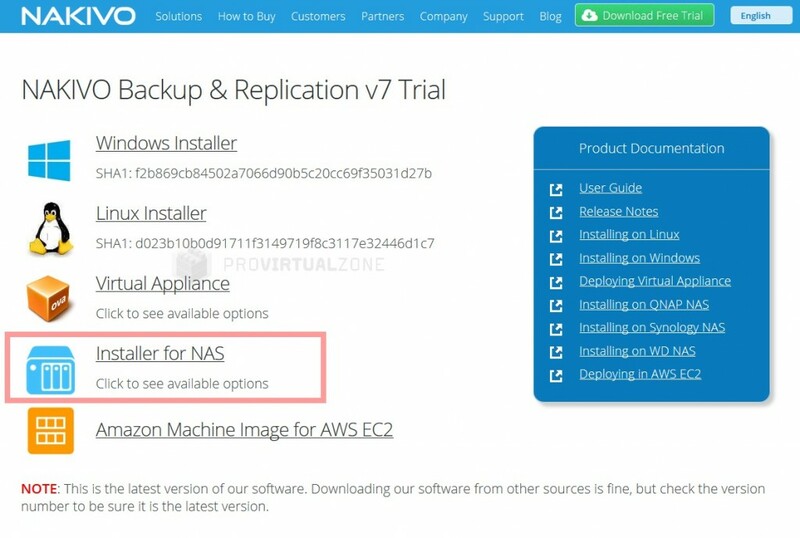 Login to your Nakivo QNAP Appliance, and Repository section, Click “Add Backup Repository” and select “Create new backup repository”. Just give a name for this repository and in the Type select “Local folder on assigned transporter”. In the option “Path to the local folder” add your QNAP Shared folder path. In this case, it is “/share/cACHEDEV1_DATA/Nakivo”. If you need to check what is your Shared Folder full path, you can connect to your QNAP by SSH (using the same credentials that you use on your browser to connect you QNAP GUI) and check it manually. Next image is an example of my Shared Folder path. 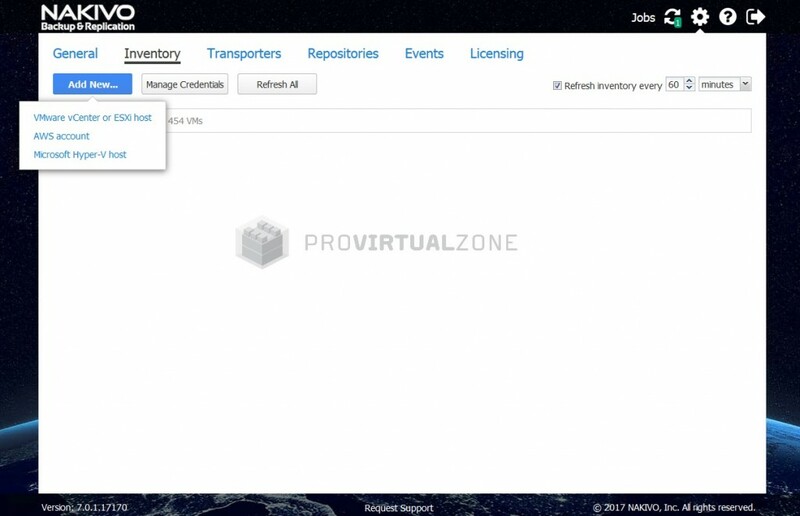 After you add all correct information to create the repository, finish by clicking create. After completing the configuration of the QNAP Nakivo Appliance, let us create one Backup Job and do some tests. We will the QNAP Nakivo Appliance, and also a Windows Nakivo Backup Tool. 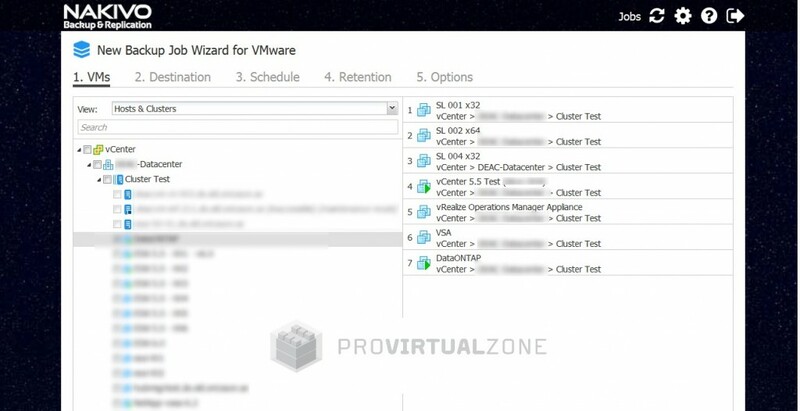 Will used the same vCenter, same Datacenter (with 2 ESXi hosts) and will create the same Backup job with 7 VMs (Windows VMs, Linux VMs and also some Appliances from VMware and NetApp). 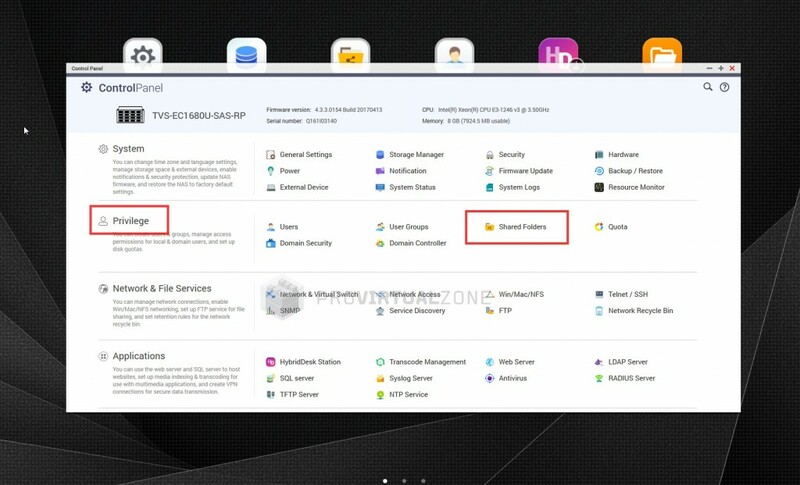 First, as we can see in the next image, QNAP Nakivo Appliance as no difference when we need to select your inventory source (VMware, Hyper-V, and AWS account). We have the same option in the Windows version. 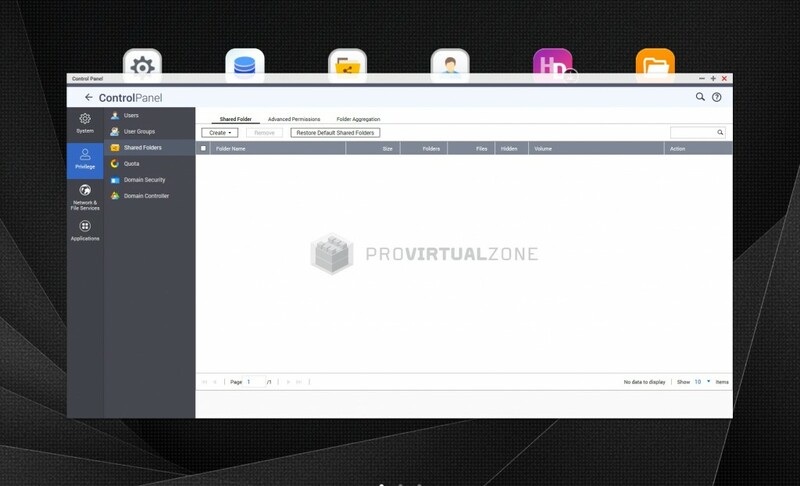 We will not go through all steps how to create a job; this was already explained in this article HERE, shows the VMs that we use. After finish the Backup Job we start the Backup job and start to measure some statistics from the QNAP and also from the ESXi hosts. First, let us check QNAP CPU and memory to check how much resources QNAP Nakivo Appliance is using from our QNAP NAS. This is a crucial measure for our final results and decisions. We do not want that Nakivo Appliance uses many resources from our QNAP and then we have a performance issue in the QNAP itself for lack of resources. A quick look at QNAP System Health. Now let us look more in detail in CPU, Memory, and Network. As we can see in the above image, while the backup is running Nakivo Appliance is only using 0.06% of the QNAP NAS CPU and 642Mb of memory. This is a very low number compared to what Nakivo Windows tool uses. This section is also crucial. 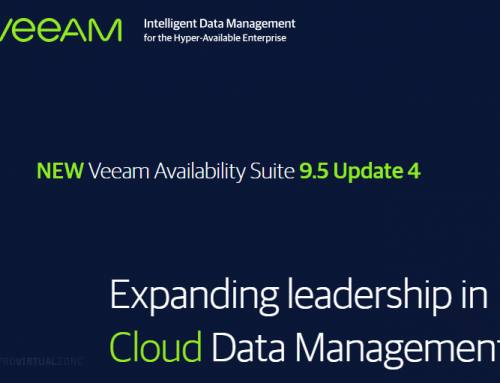 As we know, backups consume a lot of Network Bandwidth and also is important that this backup tool will grab all Network Bandwidth and leave no space for regular QNAP NAS. Since this QNAP is used for another vCenter providing 20Tb of Storage. What we can see in the above statistics is that QNAP Nakivo Appliance doesn’t consume a lot of the QNAP NAS resources and we can use while the QNAP NAS is in normal production. 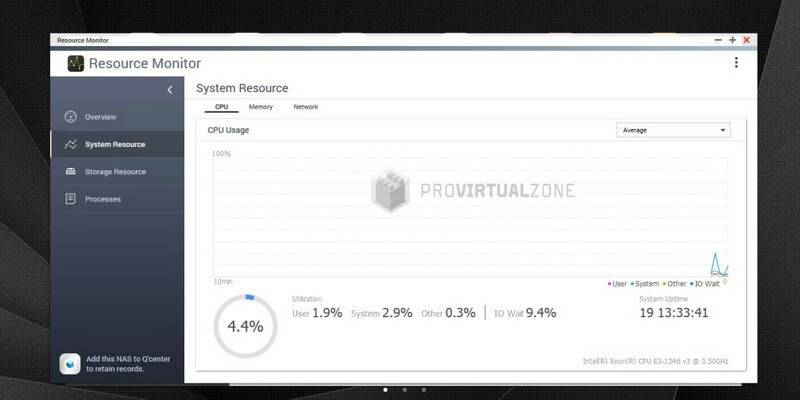 Even we have a small backup job (with a Maximum load of 6 concurrent tasks) and only 7 VMs with around 800Gb, is still a very low resource usage. However, since in the backup transporter we are just using six concurrent tasks (backup VMs at the same time), even we had a bigger job and more Data, we saw no difference. 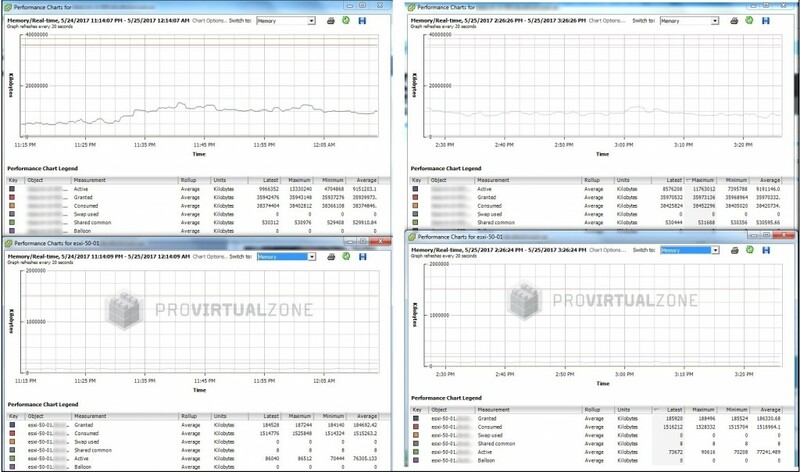 Next what I have tried to measure what was the behavior (and resources usage) of the ESXi hosts while VMs were back up by the QNAP Nakivo Appliance to see if we see any difference while running a Windows Nakivo Backup Tool. 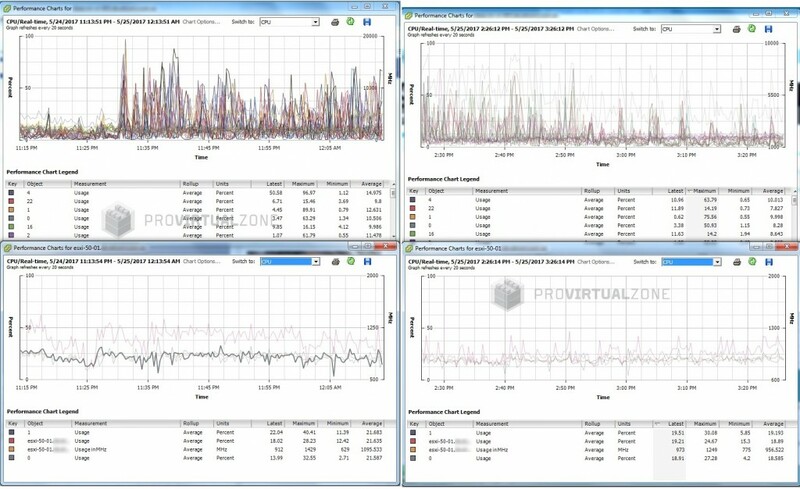 Will show statistics for both ESXi hosts that are using those VMs. 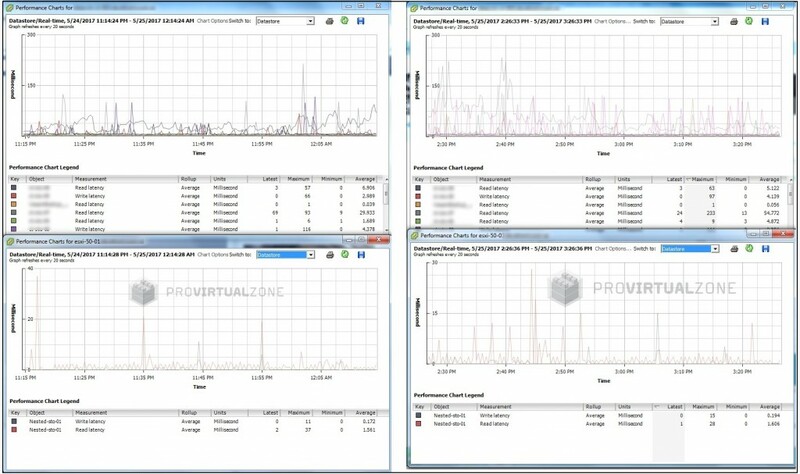 As we can see in the images above, there a small resource usage increase in the ESXi hosts when using the QNAP Nakivo Appliance. I did run the tests three times to check if this was just a coincidence because of the VMs normal usage or was from the Backup. 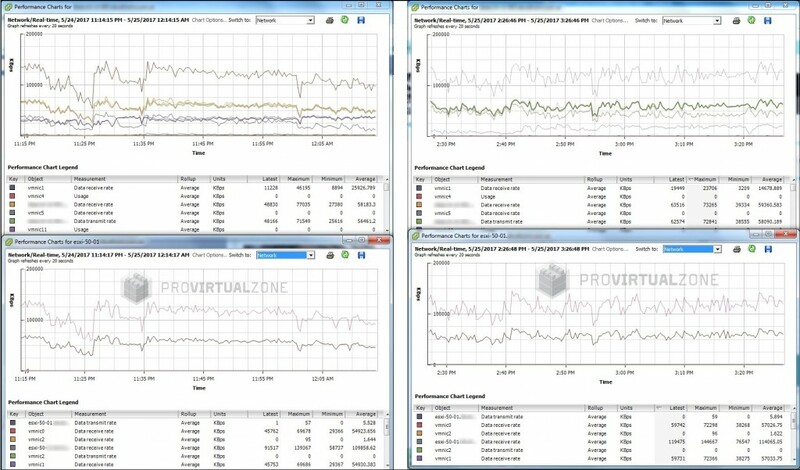 All tests show a small increase in ESXi resources usage. Why does this happen? It could be because of my environment that QNAP backup has more Storage usage and because of this ESXi hosts have more usage to handle those Storage requests. While when I am using Windows Backup, my iSCSI initiator connects directly to the Storage and most of the work is managed by the backup server, not the ESXi hosts. If we use a different transporter (besides the default) when using the QNAP Backup, maybe reduces that load from the ESXi hosts. Honestly did not test this, but plan to check and then update this article with my findings. What about the speed of the Backup itself? In the next images, we see the differences between the two tests. As we can see in the above images using Windows Backup is a little bit faster than using the QNAP Backup. 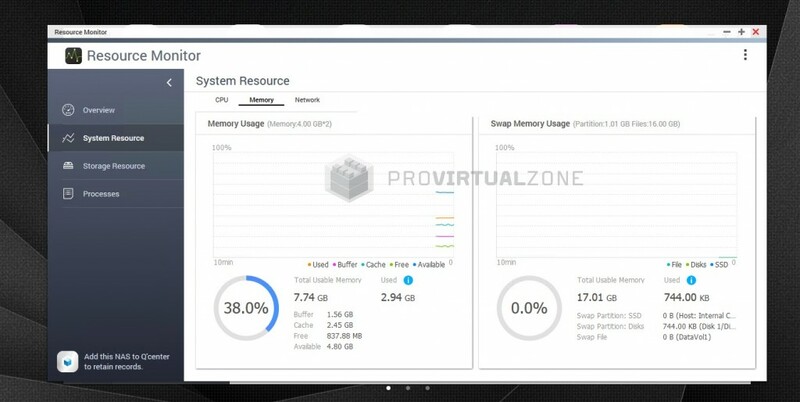 However, again, like in the ESXi hosts resources, this could be because a better connection to the source Storage using iSCSI initiator. Again, possibly if we use the second transporter in the QNAP, we could have the same result or even the best results. To be tested then. QNAP Backup or Windows Backup? Looking at the results that we see in these tests, if I have to decide which one I should implement in my environment, with this environment, I would choose for the QNAP Nakivo Appliance. 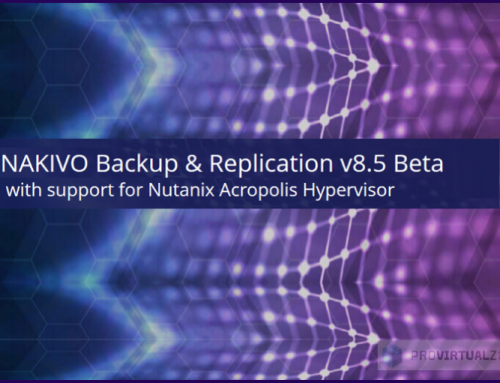 No need for extra hardware for a Backup Server (even use Nakivo as a VM, we have a fewer resources and load used in the ESXi hosts). No need for extra Guest OS licenses. Connection directly to the destination Storage (if use QNAP as the destination repository). Note: Will try to do some extra tests and update this article with the results. 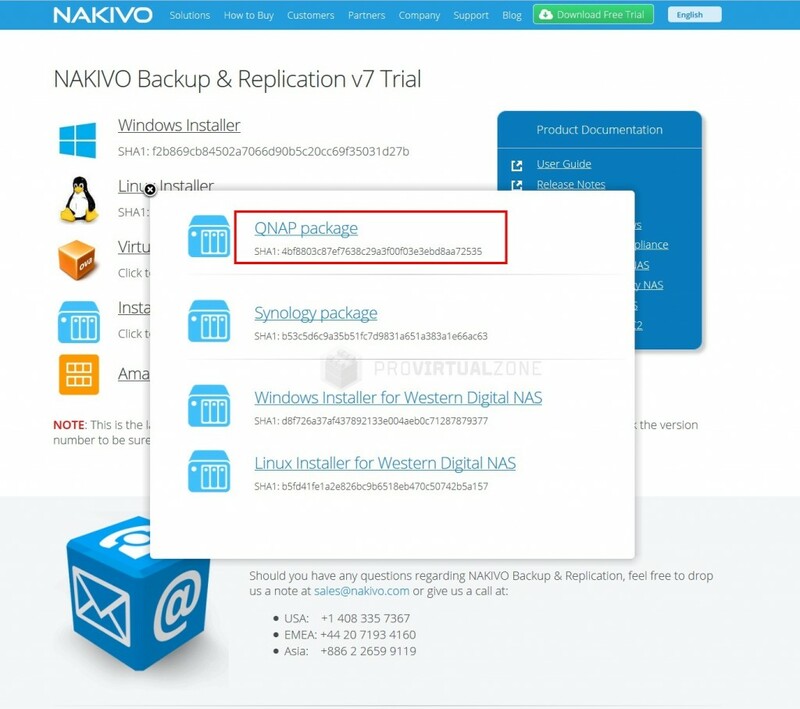 Hope this can help you not only to install Nakivo in a QNAP NAS but also decide if you should use a QNAP Nakivo Appliance or a Windows Nakivo Backup tool.